Mayor de Blasio wants NYC on track to reduce greenhouse gas emissions by 80 percent by 2050, but reducing transportation-related emissions won’t be possible without a significant mode shift away from private vehicles. Transportation accounts for more than a quarter of citywide greenhouse emissions, and a whopping 92 percent of that comes from cars and trucks. Reducing the number of cars on the streets is essential to the mayor’s emissions goals, according to the “Roadmap to 80 x 50” report released this week by the Mayor’s Office of Sustainability [PDF]. The report proposes a decrease in the percentage of trips in private vehicles to 12 percent from the current 31 percent. Bikes would play an essential role in the shift, increasing from a 1 percent to 10 percent share of total trips — as would buses and trains, which today account for only eight percent of total citywide emissions. Earlier this month, DOT released a blueprint for increasing bike mode share in its five-year strategic plan, which includes protected bike lanes and a five-borough Citi Bike system. 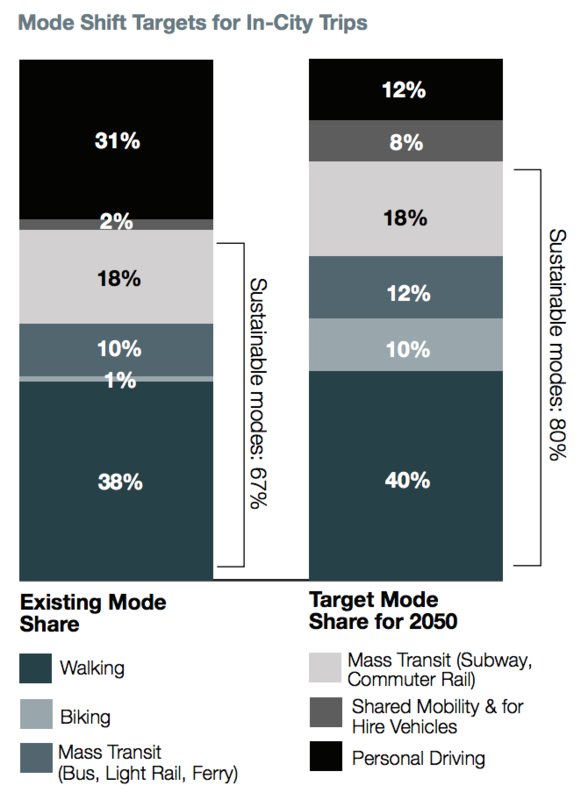 The Office of Sustainability report also acknowledges that the city has a long way to go before cycling is an accessible transportation option in many parts of NYC. The “Roadmap” report also assumes an increase in bus ridership — which the slate of reforms proposed by the NYC Bus Turnaround Campaign could help make possible. The report highlights the public health effects of high emissions. Fine particulate matter, or PM2.5, released by vehicles causes 320 premature deaths and 870 emergency room visits each year, according to the Department of Health and Mental Hygiene. With 90 percent of total vehicle miles traveled coming from trips not beginning or ending in the Central Business District, Upper Manhattan, the Bronx, Brooklyn, Queens, and Staten Island are bearing the brunt of those emissions. To reduce emissions, bikes and other modes must replace car trips within the city, which account for 65 percent of total car trips citywide. The report includes an interim goal of a 40 percent greenhouse gas reduction by 2030. It also lays out a business as usual scenario, with mode share relatively unchanged. In that case, greenhouse gas emissions would decline, thanks to improving technologies, but only by 36 percent by 2030 and 40 percent by 2050, compared to 2005. > E.g. the N700 Shinkansen travelling between Tokyo and Osaka uses about 0.086 MJ/seat-km. This conversation has gone off the rails, so to speak. The OP is about LOCAL transportation, which HSR by definition is not. But since local transport forms the bulk of transportation demand, it’s the most important to get right in terms of CO2 footprint. So… if you’re talking local transportation, you can talk about cars with a load factor of 1.2, bikes, walking, commuter rail, light rail, city buses, and subways (all with a load factor of 25-50%). You cannot talk about HSR, intercity buses, cars fully loaded for a family vacation, fully loaded subway cars, etc. BTW… one big difference between the two classes is that load factors are higher across the board on long-distance travel than on local transit. Even in automobiles, long-distance trips have higher load factors. > E.g. the N700 Shinkansen travelling between Tokyo and Osaka uses about 0.086 MJ/seat-km. The average load factor of the Tokaido shinkansen is somewhere in the range of 65-70%, so on average that’s about 0.13 MJ/person-km. As shown above, this is about 100 pMPGe — which is on par with a Prius carrying just two people (typical, if a little low, for long-distance automobile load factors). A Tesla will beat the c*** out of the Shinkansen efficiency figures, even if it’s single-occupancy. Of course, the Shinkansen will get you there faster than either the Tesla or the Prius. Find the numbers. When you divide by the enormous numbers of miles travelled (3 trillion, that is 3×10^12), I doubt it will make much difference. For example… if we spend $10b/yr (that’s $10^10) on some kind of “hidden subsidy” for driving, that is only .3 cents per mile. > It seems to me the recumbent position of velomobiles make them quite a bit safer in crashes than regular bikes. This might put “safe” speeds closer to 35 or 40 mph, perhaps even higher. Explain why the risk of death for pedestrians goes up drastically if hit by cars going >20mph — but it would not do the same in some magic-land for recumbent bikers hitting cars / trees / etc. at >20mph. Unless the recumbent bikes have some kind of crash protection or crumple zone, I have a hard time believe they’d be any safer than a Yugo or Fiat going a similar speed. E-bikes use a miniscule amount of energy, even if you don’t move closer to work. Unfortunately, large cities demand long distances. For example… 40 miles/day on an e-bike is equivalent to about 4 miles/day in a Nissan Leaf, and uses about $.10 of energy. Some will better adapt to one than the other. Both are good options, and are vast improvements over 40 miles a day in a old SUV. The vehicle actually even hit some people when it ran off the road and yet nobody was seriously injured, much less dead. As for hitting automobiles, that’s going to be an issue regardless of speed. A cyclist going 12 mph who gets broadsided by an automobile is going to far no better than one going 30 mph. The bottom line here is velomobiles are safe in crashes at the speeds they’re likely to achieve as is. They will fare no worse (or better) in collisions with motor vehicles than regular bicycles but the physics dictate there really aren’t any solutions to that anyway other than physically separating motor vehicles from anything human powered. The Shinkansen going the same speed as the Tesla or Prius will beat the pants off either in terms of energy efficiency. That’s why both I and Miles Bader caution that you need to be really skeptical about the figures floating around for rail efficiency. And the purpose of putting a comment like this in is? It’s your anecdotal experience which is utterly meaningless. You might be one of those people who cross right in front of moving bikes midblock for all I know. The statistics show bikes injure and kill more than two orders of magnitude fewer pedestrians than motor vehicles. I think we could probably safely assume autonomous vehicles will eventually get us to near zero death rates. If we electrify them, which seems highly likely, then the pollution issue is fixed also. However, the primary problem still exists, which is as you said thousands of vehicles moving around in a small space. You can fix that somewhat by making the vehicles smaller. After all, most of the rationale for big, heavy vehicles is crash protection. That falls out the window when the vehicles never crash. Still, thousands of “smaller” vehicles still isn’t as space efficient as relatively few larger ones. I think autonomous cars will prove revolutionary for the suburbs. There they’ll negate the need for automobile ownership while eliminating congestion. In cities you’ll still need conventional mass transit using larger vehicles operating on fixed or semi-fixed schedules and routes. I think your conversion between electircal usage and “equivalent” gasoline use is off. The Tesla Roadster was rated at 32 kW-hrs/100 mi in city driving, or also about 100 MPGe. That is equal to (32 * 3.6 MJ/kwH * .6 mi/km) = .072 MJ/km. Land use and transportation are inseparable. Do you have a city to go with the EMU? How many times do you have to run it mostly empty to get people to be willing to sell their cars and depend on the train to get around if you put those tokyu 5000s in eastern Queens or Staten Island? This gives us 3.68 MJ/trip. I couldn’t find any info on average trip length but let’s assume it’s 5 miles (8 km). That gives us 0.46 MJ/person-km, or converting to the units used by Elizabeth 1.45 l/100pkm. Note however that the MTA power use figure also includes the power used to light stations, track, signals, and to power ancillary equipment like pumps. Despite that, my calculations are still giving numbers fully 3 times better than her source. The only way the other number make any sense would be if the average trip length were closer to about 1.5 miles. That’s highly unlikely given NYC’s size plus the fact NYers generally use buses for those shorter trips. This is not a useful conversation. The Shinkansen does not go the same speed as a Tesla on a regular highway. Nobody would take it if it did. > The Tesla roadster uses about 0.5 MJ/km. Where do you get this? Based on EPA ratings (referenced above), I concluded the Tesla roadster uses about .07 MJ/km. (The point of this was to arrive at a conversion between MJ/km and MPG, not necessarily to compare trains to Teslas). Unless we can agree on basic facts, there can be no hope of a useful conversation. When you compare HSR with the way people actually use automobiles on long trips, HSR doesn’t look like such an obvious winner any more. Except, all the numbers show nothing more than marginal efficiency improvements, if that. Remember that you must compare your HSR with automobiles containing at least 2-3 occupants (the mean for long-distance auto travel). > Assuming 121MJ per gallon of gasoline (a standard figure), a 50mpg car with 2 passengers (typical?) will use 0.75 MJ/person-km. You are missing the significant thermal losses involved in heat engines. If you were to power an electric car with that gasoline, you’d have to first generate electricity. Out of 121 MJ in that gallon of gas, you’ll end up with only 40-50 MJ in the end, if you burn it in the best thermal electric generators (33-50% efficiency). Without taking that into account, any electric vehicle looks 2-3X as good as it really is, when comparing against gasoline or diesel vehicles. The Tesla roadster uses about 0.5 MJ/km. Where do you get this? Based on EPA ratings (referenced above), I concluded the Tesla roadster uses about .07 MJ/km. I actually just googled for something like “tesla energy efficiency” and the first N hits all give a roughly similar range of figures which I averaged to get 0.5. The official EPA fuel efficiency rating, specifically for the “2016 Tesla Model S AWD – P90D” (I just picked randomly, I looked at other model S figures, and they’re all roughly similar) is given as “95 mpg (combined) / 35 kWh/100miles”. 35 kwWh/100miles is 0.8 MJ/km. If you go to Tesla’s website and look at their figures for driving costs, you can derive a roughly equivalent figure (you wouldn’t expect them to be exactly equivalent, because the EPA ratings are averages over a range of situations, whereas the Tesla advertising figure uses very specific values). (The point of this was to arrive at a conversion between MJ/km and MPG, not necessarily to compare trains to Teslas). Unless we can agree on basic facts, there can be no hope of a useful conversation. The conversion factor I use for gasoline to energy is the “MPGe”, which is what the EPA uses, and is approximately 121 MJ/gal. Using this value for MPGe, the conversion between the two official figures for Tesla efficiency (mpg and kWh/100miles) checks out, so it’s clear the EPA is using that here. You should reevaluate your crossing habits. Over/under on how many pedestrians you have hit while running reds: 9.5. A lot of those who complain about being hit by bicycles/autos on a regular basis typically don’t look before stepping off the curb. You should always look both ways even if you have the right of way. Most people have never been hit by a bicycle/auto. It’s true that bicyclists often run red lights, and they should yield first; but they are far too predictable, narrow and nimble to strike people on a regular basis. In comparison, an automobile cannot stop has quickly, maneuver as well, is much larger/heavier, and does not have as good visibility. Those characteristics make them a far greater threat. Look both ways before you step off any curb and you will be far safer from collisions. Keep in mind that emergency vehicles can often approach from the opposite direction as well. The truth about cycling: it’s ridiculously dangerous and declining in popularity. But yeah, let’s spend billions of dollars to help out a tiny fraction of the population. Bicycling is gaining in popularity in NYC. It’s a great option for most short trips. The city would be far better off with more bicyclists. I also thought that statement strained credulity. However, I’ve noted people see what they want to see. If someone is only looking for cyclists going through red lights that’s all they’ll see. They’ll fail to notice the ones who don’t go through. The exact term for it is confirmation bias. I’ve even used that argument when some here mention that cyclists are hurting their own cause by going through red lights. People who think cyclists are flagrant scofflaws just won’t notice anyone who is law-abiding. If those are the people we seek to get on our side then I feel it’s already a lost cause regardless of what we do. Thankfully, rabid bike haters like evo34 seem to be a pretty small minority. They’re also of the age when many are starting to die off. Between them, Cuomo and de Blasio have the power to dramatically accelerate New York City's progress on climate goals. But doing so will require making policy choices that the governor and mayor have shirked or avoided so far. De Blasio dismisses the importance of getting out of his SUV. But if he's getting chauffeured everywhere he goes, there's no way the mayor can viscerally understand what the three-quarters of New Yorkers who don't commute by car experience on a daily basis. If he doesn't regularly experience what it's like to get around without driving, he won't feel on a gut level why improving transit, biking, and walking is so important.